Last Wednesday we entered the season of Lent. “Lent” is a word derived from another word which meant “lengthening days” which was itself formed by combining two Old High German words meaning (langaz “long” + tina “day”). Ash Wednesday this year was on March 1; in 2018 it will start two weeks earlier—on February 14. Lent was originally a period of 40 days of fasting between Ash Wednesday and Easter. The days of fasting matched the forty days and forty nights that Jesus spent in the wilderness, where he ate nothing and was tempted by the devil. But wait; Easter is on April 16, and there are 46 days between March 1 and April 16, so how do you get only 40 days? More accurately, Lent is a period during which there is traditionally 40 days of fasting. One doesn’t fast on Sunday. Sunday is the day of the celebration of the resurrection. There can be no fasting on Sundays. Skipping the six Sundays leaves 40 days of fasting. The “temptation of Christ” is another one of those stories that appears only in the synoptic gospels. It’s not mentioned in John. The introit is “Be Still and Know” by J. Jerome Williams. He attended Mars Hill College in Mars Hill, NC, and Appalachian State University in Boone, NC. J. Jerome Williams taught high school band and was the choir director of the First United Methodist Church in Hickory, North Carolina, for 31 years, retiring in 2007. As it is the first Sunday of Lent and the theme is the temptation of Christ in the wilderness, three of the hymns are the same as those used on the first Sunday of Lent last year and also on the first Sunday of Lent in 2015. The opening hymn is “Jesus Walked this Lonesome Valley,” hymn no. 80. It is called an “American Folk hymn” in some hymnals. In others it is called a “traditional spiritual” or an “African American spiritual” or just an “American spiritual.” It wasn’t usually thought of as a song to be included in a hymnal and appeared in only ten hymnals before 1975. It has become more popular as a hymn since that date. That he was --- a preacher too! And we’ll win that great big union by and by. The anthem will be the same thing we sang on January 29, "What Does the Lord Require?" (music by Jim Strathlee ), but this time it will be sung as a round. Genesis 2:15-17 and 3:1-7 are the verses of the Old Testament reading. It is the story about what Eve does after the serpent tells her that God wasn’t telling her the truth when he told her that if she ate from the tree in the center of the garden, that she would then die. So she took some of the tree’s fruit and ate it. 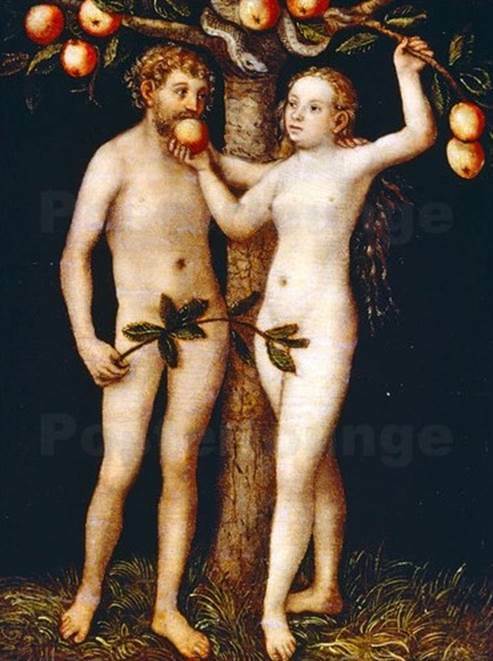 And as Adam was there with her, she gave Adam some of the fruit also. What I like best about this painting is that Adam is scratching his head. Adam is probably thinking, “What’s this? A piece of fruit? Why is she getting so lovey-dovey all of a sudden? 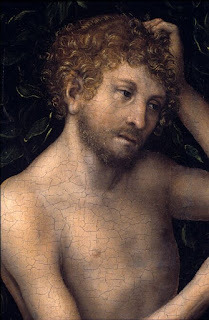 Is this some trick?” But having not yet eaten of the fruit, he too cannot tell good from evil, and, feeling a bit puckish and also finding the matter much too difficult to ponder over for very long, Adam takes a bite. Lucas Cranach the Elder (or those in his workshop) painted several versions of Adam and Eve and The Fall. 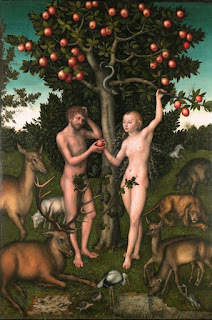 This one appears to place more of the blame on Eve, as Adam doesn’t even take hold of the fruit. 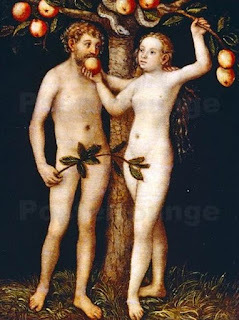 Instead, Eve is shoving the fruit in his mouth. The gospel reading is Matthew 4: 1-11. In this reading, the devil tries to tempt Jesus. But Jesus was already wise and knew the difference between good and evil. He was able to resist. Claudia F. I. Hernaman was the wife of Rev. J. W. D. Hernaman and the daughter of W. H. Ibotson, who at one time was the Vicar of Edwinstowe. She was born on 19 Oct 1838 at Addlestone, Surrey. Most of her 150 hymns were written for children to sing. She died in Brussels, Belgium, on 10 Oct 1898. “Jesus, Thou Joy of Loving Hearts,” hymn no. 510, is the communion hymn. 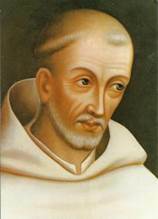 The words were originally authored by Bernard of Clairvaux (1091-1153) and translated to English by Ray Palmer, 1858. The tune was composed by Henry Baker and is called QUEBEC (1854). https://youtu.be/jsqHOt29_48 “Jesus, Thou Joy of Loving Hearts,” played by Andrew Remillard from the burgundy Presbyterian Hymnbook (1955). 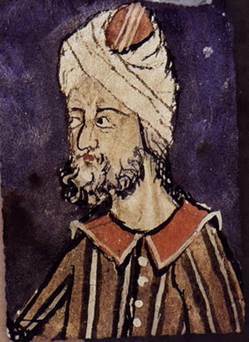 The Second Crusade was a monumental failure. There was much distrust among the leaders of the various Christian forces. Even the marriage of Louis and Eleanor, who had personally gone to Jerusalem, fell apart. They sailed back to France in separate ships. The closing hymn is “Forty Day and Forty Nights,” no. 77. This same tune is instead sometimes called HEINLEIN. The name AUS DER TIEFE RUFE ICH derives from the first use of the tune, which was with a text based on Psalm 130. The words are by George Hunt Smyttan. A graduate of Cambridge (1845), he was ordained a deacon (1848), a priest (1849), and appointed rector of Hawksworth (1850). He died suddenly at Frankfort-on-the-Main on 21 Feb 1870. He was not buried in the Frankfort great Cemetery, but in a newer one on the other side of the river Main. As he had died suddenly, and was entirely unknown in Frankfort, and had no relatives with him, and as there was no possibility of communicating with his relatives, he was entered simply as “Smyttan,” “England,” and buried among the poor in an unpurchased grave. The tune is by Martin Herbst who was born in Rotenbach, Germany, on 15 Jan 1654. Herbst died in Eisleben in 1681 – of plague. The prelude is the tune CONSOLATION by Felix Mendelssohn-Bartholdy. The tune is used with words by Harriet Beecher Stowe. Her hymn is called "Still, Still with Thee When Purple Morning Breaketh." The arrangement is by P. Slack. Harriet Beecher Stowe also wrote Uncle Tom’s Cabin. One of the South Haven Presbyterian Church’s pastors, the Rev. Ezra King, received his theological training from her father, Rev. Dr. Lyman Beecher. (Rev. Lyman Beecher was the minister of the East Hampton Presbyterian Church from 1798 to 1810.) Her brother was the infamous Henry Ward Beecher of Plymouth Church of the Pilgrims, 75 Hicks St., Brooklyn. William Charles Stickles was born in Cohoes, New York, on 07 Mar 1882. He was a composer, arranger, teacher, and editor. The postlude is "Introduction—Choral” from Suite Gothique by Léon Boëllmann. https://youtu.be/z6aJ525SGPs Léon Boëllmann’s "Introduction—Choral" from Suite Gothique played by Jonathan Farnsley on an 86-rank Aeolian Skinner pipe organ at the Second Presbyterian Church, Indianapolis, Indiana. Jonathan Farnsley is 18. Boëllmann was born 25 Sep 1862 in Ensisheim, Haut-Rhin. He was educated in Paris, entering the School of Classical Religious Music when he was only nine years old. He died at age 35 on 11 Oct 1897.